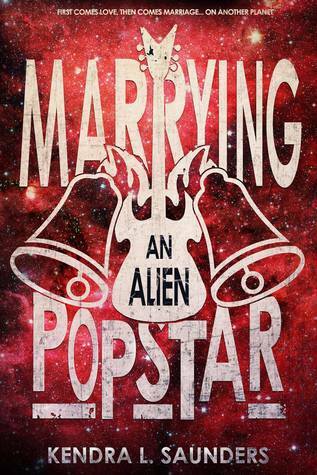 Marrying an Alien Pop Star is the perfect laugh-out-loud romantic finale to the beloved Alien Pop Star series. Somehow, every time I return to Earth, the awful smells that make up New York City seem even more welcome to my nose. A woman can only be without the olfactory cocktail of garbage, cheap coffee, morning cigarettes, and desperate hangovers for so long. Finally, finally, here Griffin, Dev and I are, setting foot in the East Village with nothing but our clothes, one bag, and a bunch of semi-counterfeited money. Okay, not semi-counterfeited. Completely counterfeited. Griffin and Dev can create stacks of fake Earth currencies with almost no effort, which is disconcerting if I think about it for too long. I try not think about it at all, actually. Griffin tips himself over a filthy looking garbage can and throws up for all he’s worth. I wander away a little and stare at taxis rolling by, willing my own stomach to calm down. I’ve ‘traveled’ through space several times with Griffin, but it really doesn’t make it any easier, evidenced by my stomach’s gleeful attempt to empty everything inside it as soon as we land at our destination. Usually, I can bully my stomach into calming down before anything actually manages to come up, but the same can’t be said for Griffin. Somehow, he’s a million times worse at traveling through space than I am, despite his people’s advanced capabilities. And see, I love him, and aspire to comfort him when he’s feeling sad or sick, but I know better than to get too close at a time like this. Besides, that’s exactly what Griffin’s best friend Dev is for. Griffin raises his head and grumbles something about not feeling very blissful, and then lurches forward to vomit again. “I’m not alright!” Griffin replies, flailing his hands around while still leaned fully over the bin. His praise is justified, because this is actually kind of a big deal. Griffin is infamously terrible at travel, and has sent himself to a few dangerous places by accident over the years. Of course, reminding him of this fact never goes over well, and today is no exception. He raises his head again to pin Dev with a nasty look. “I happen to be…” he starts to say, and then takes a long pause, “somewhat better at traveling than I used to be, thank you very much.” With that, he pukes again, and Dev bites his lower lip to keep from smiling. 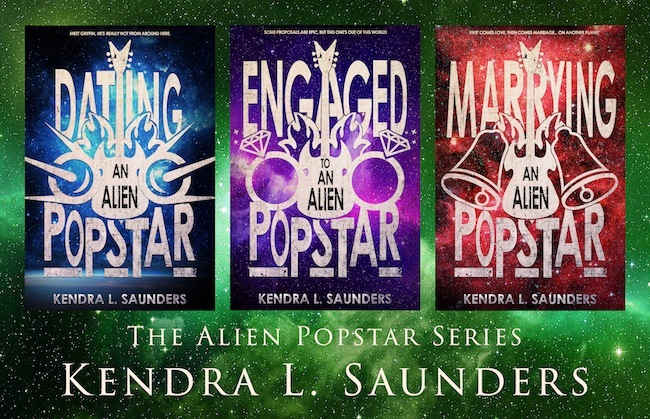 Kendra L. Saunders is a time-and-space traveling fashionista author who writes books about magical, dark-haired men, interviews famous people, and suggests way too many bands to you via whatever social media platform she can get her hands on. She writes with good humor because humor is the best weapon for a girl who can't learn karate (or ballroom dancing). 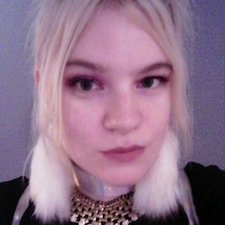 She's the author of the Alien Pop Star series, The Unlove Spell, magic realism novel Inanimate Objects, the dark comedy Death and Mr. Right, and the poetry collection Geminis and Past Lives.